FORTE 10 offers an entirely new sound quality; additionally the FORTE 10 Premium Edition offers a comprehensive orchestral sound library with unparalleled sounds (listen to examples below!). Earlier, FORTE used your computer system to produce sounds, but now FORTE produces sounds from its own library, independent from your computer system! If you have soundfonts you can use these with the FORTE Player and add them to your individual sound library. You can integrate up to 16 soundfonts, with nearly unlimited instruments! 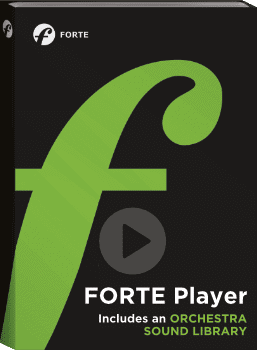 FORTE Premium Edition: the FORTE Player with orchestral sound library is already included! FORTE Basic and FORTE Home Edition:The FORTE Player can be purchased separately for a great price and the FORTE Player will be added through the included VST interface automatically after installation. FORTE Player with the orchestral sound library is available for $ 49 only! Listen to our sound examples from FORTE! Just click on the respective play button. You will be amazed!